The primary goal of the Emergency Home Repair Program is to reduce the immediate threat to life, health, and safety in the homes owned and occupied by low-income people living in Buncombe County. You may be eligible for the program if you own and occupy your home and are either elderly, disabled, a single parent, or a family with three or more dependent children. Certain income restrictions also apply. Are you a single parent with a child under 18? Do you have three children under 18? If you own your own home and answered yes to at least one of the above questions, you may be eligible for this program. Enter your contact information below, and you will be sent more information. MHO is a private, non-profit, community development corporation. Founded by volunteers in 1988, the organization’s first task was to repair the roof of an elderly widow living in Leicester, NC. That repair was the beginning of MHO’s Emergency Home Repair program, which now repairs the homes of more than 150 low-income homeowners each year; all elderly, disabled, or families with small children. In its 30-year history, MHO has served 6,000 households. 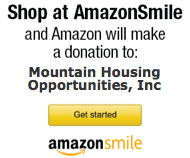 MHO currently serves over 600 households each year. For information and forms to use, contact Joy Wilcox before the deadline at 828-254-4030 ext. 129. MHO is an equal opportunity contractor. All qualified contractors and subcontractors including women and minorities are encouraged to bid. Bids are due in the MHO offices by 10AM Wednesday, January 23, 2019. Bids will be publicly opened at that time.